FilmThreat.com Releases Oxford FF Lineup! FLS has TWO showings! See you there! "Father-Like Son" officially selected into the Oxford Film Fest! FLS will be in competition for the Grand Jury Prize. We're coming for you, Ole Miss! Check Out this Quote from the New Orleans Film Fest! We've officially teamed up with Pit Viper Sunglasses to bring you all kinds of badass and dumbassery! Make sure you check them out by clicking the babe or go here http://pitvipersunglasses.com. FLS to have Encore Screening! LSU's newspaper takes care of its' alumni. 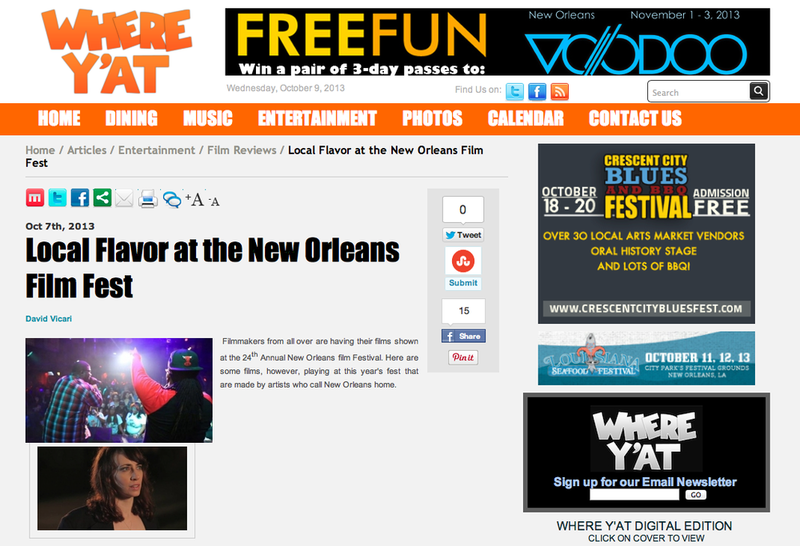 Where Y'at chose "Father-Like Son" to be 1 of 3 films it covers leading up to the NOFF. Can you spot Kirk Cameron? Examiner.com is a top 100 website, reaching over 37 million unique visitors a month. Click the image for the article! "Father-Like Son" to Have World Premiere! We are proud to announce that Father-Like Son will have its WORLD PREMIERE at the Prytania Theatre in Uptown New Orleans on Friday, October 11 at 10:15 PM. FLS is also up for Best LA Film! Please be sure to keep up to date with ticket information as the seats will be going fast. Tickets go on sale October 8th.